For other uses, see St Erth (disambiguation). 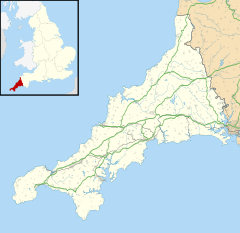 St Erth (Cornish: Lannudhno) is a civil parish and village in Cornwall, England, United Kingdom. The village is four miles (6.5 km) southeast of St Ives and six miles (10 km) northeast of Penzance. St Erth takes its name from Saint Erc, one of the many Irish saints who brought Christianity to Cornwall during the Dark Ages, and is at the old crossing point of the River Hayle. The Cornish name of the place derives from St Uthinoch of whom little is known. The parish shares boundaries with Ludgvan in the west, Hayle in the north, and St Hilary in the south. The current church of St Erth dates from the 15th century, though an older church is said to have once stood on St Erth Hill overlooking the village. St. Erth also has a railway station situated 0.75 miles from the village, along the branch line between St Ives and Penzance. The old coaching road once led through the village, before the building of the Causeway in 1825 along the edge of the Hayle Estuary. Prior to 1825 anyone wanting to go from Hayle to St Ives or Penzance had to cross the sands of Hayle Estuary or make a significant detour crossing the River Hayle at the ancient St Erth Bridge. The Star Inn, in St Erth village centre, is a fine coaching inn dating from the fourteenth/fifteenth centuries. It was along this route that tin was carried upcountry from the stannaries of Penwith. Guides took travellers across the sands, but, even with guides, it was sometimes a perilous journey and the shifting sand and racing tide claimed several lives. Because of this major obstacle to trade, a turnpike trust was formed, with Henry Harvey a trustee, to build the causeway which now takes the road below the plantation west to the Old Quay House. Costing £5000 in 1825, the investors charged a toll to use the causeway to recover their costs. Langdon (1896) recorded that six stone crosses existed in the parish, including two in the churchyard. St Erth was the site of a large creamery operated by United Dairies: this was responsible for processing a large quantity of milk produced in Penwith. Trewinnard Manor is an early 18th-century house built on a different site from its medieval predecessor by the Hawkins family. Trelissick Manor is a medieval house remodelled in 1688 for the Jacobite James Paynter, again remodelled in the 18th century and extended in the 19th century. Tredrea Manor is a 17th-century house but it was largely rebuilt c. 1856. The front is of five bays built in ashlar. St Erth Sand Pits was the site of choice for the extraction of clay for the fixing of candles to the helmets of miners. It also was the site of significant fossil finds and in 1962 was designated a Site of Special Scientific Interest (SSSI). However, the main use of the sand in this location was for the metal foundries throughout Cornwall and beyond. The sand grains are found coated with a thin film of clay. With gentle pressure and the correct percentage of water the sand grains will bind together and can be used for making a sand mould into which molten metals can be poured from making engineering castings. A good source of clay for the fixing of candles to the helmets of miners was St Agnes Beacon. The parish church is dedicated to St Erc (Latin Ercus) and is probably of the 14th century. It is not a large church and has a west tower of three stages. There are north and south aisles, the arcade in the north aisle having piers of two different types. The church was restored in 1874, at which time two dormer windows were inserted in the roof. The wagon roof of the south porch is old and the font is Norman and of an unusual square design. The ornate wooden roofs of the nave and aisles and fine oak screen decorated with the Four Evangelists are due to the restoration of 1874. The church is sited in a wooded area and the churchyard, according to Charles Henderson, "greatly enhances the building". The names of eight places in the parish are recorded as having chapels or shrines in the medieval registers, including Bosworgey (St Mary Magdalene) and Gurlyn. There are six Cornish crosses in the parish: two are in the churchyard and the others are in the churchtown and at Battery Mill, Tregenhorne and Trevean. For the purposes of local government St Erth forms a civil parish and elects eleven parish councillors every four years to St Erth Parish Council. The local authority is Cornwall Council. St Erth is twinned with Ploulec'h in Brittany, France. The Rev. William Paynter, (1637 – 1716) Anglican clergyman and Vice-Chancellor of Oxford University was born at Trelissick Walbert, in the parish of St Erth. Major Herbert Augustine Carter VC (1874 – 1916) son of the vicar of St Erth. Served in two campaigns in East Africa. He is buried at St Erth in a plot planted with tropical plants including laurels and castor oil plants. His Victoria Cross is displayed at the Duke of Cornwall's Light Infantry Museum at Bodmin. Admiral Sir Henry Bernard Hughes Rawlings GBE KCB (1889 in St Erth – 1962) Royal Navy officer, became Flag Officer, Eastern Mediterranean during World War II. ^ Place-names in the Standard Written Form (SWF) : List of place-names agreed by the MAGA Signage Panel. Cornish Language Partnership. ^ "St Erth Sand Pits" (PDF). Natural England. 1986. Retrieved 28 October 2011. ^ "St Erth". Oliver's Cornwall. Retrieved 3 May 2010. Wikimedia Commons has media related to St Erth. This page was last edited on 1 July 2017, at 09:40 (UTC).